The students in our Karma Project at Harmony Heights are teen girls living in a residential facility for students who are not able to attend mainstream school because they are considered to be emotionally disturbed and fragile. 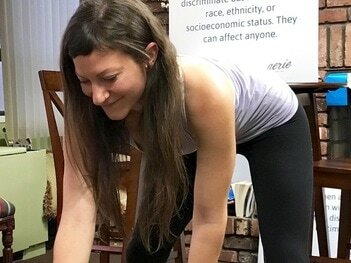 Our teacher offers trauma-informed restorative and gentle yoga, breathing techniques and guided mindfulness weekly. These techniques are scientifically supported to shift our nervous systems reaction to everyday stressors, and are shared in a way that the teens can weave the practice into their daily lives. Jenny Jared is the CoFounder of United We Om and a proud mother of two beautiful humans. She has shared yoga with homeless mother and their children, in eating disorder treatment facilities, and with foster care teens. Her own experience as a teen and young adult ran the gamut from depression to anxiety and eating disorders, and she feels blessed to be able to share the practice that had such a positive impact on her own healing. "Harmony Heights is a therapeutic residential and day school serving girls with emotional needs that cannot be adequately served in the standard high school setting. Situated in Oyster Bay, New York, Donald Lafayette established Harmony Heights in 1974, and it has served as an outstanding resource for education and emotional healing for 42 years. Harmony Heights is a NYS chartered and registered high school and offers regents and local diplomas. From teachers to school counselors to therapists, the staff at Harmony Heights represents the finest caliber of professionals each dedicated to the emotional, social and educational well-being of our students. In a caring, supportive atmosphere that stresses self-worth, self-reliance and hope for the future, Harmony Heights' girls discover the inner resources necessary to overcome adversity and conflict, to become fulfilled, productive individuals. "